Last week I had the opportunity to visit The National September 11 Memorial, located at the World Trade Center site in lower Manhattan. 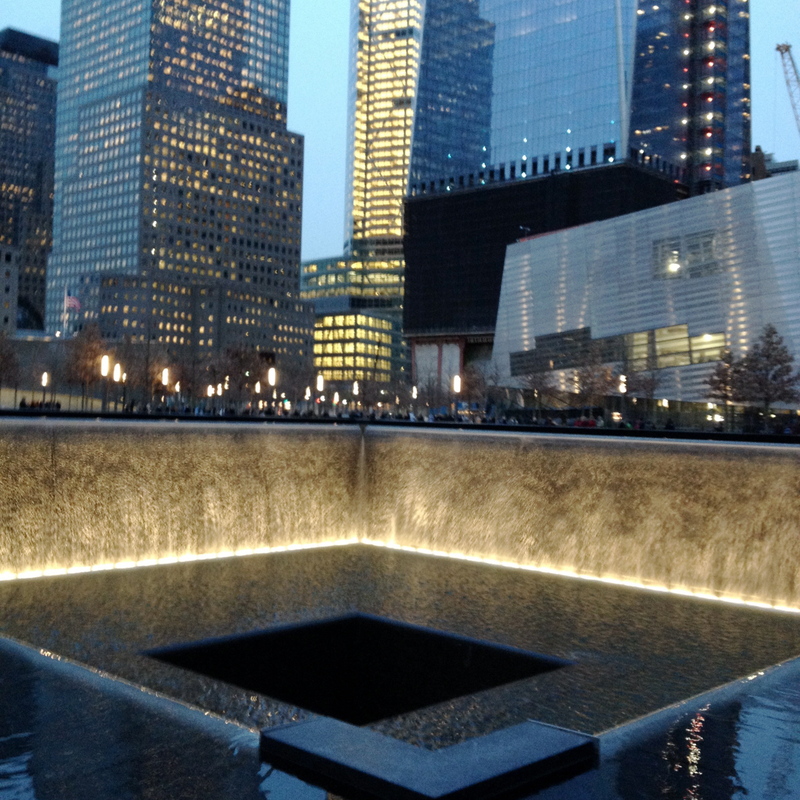 The memorial is dedicated to the nearly 3,000 people who died on September 11th, 2011 in the Twin Towers, Shanksville, PA, and the Pentagon, as well as the 6 people who died in the WTC bombing in 1993. In 2003, an international design competition was held to create the memorial. Of 5,201 submissions, architect Michael Arad’s design was chosen, and executed in conjunction with landscape architect Peter Walker. The winning design, “Reflecting Absence” showcases two grand waterfalls and reflecting pools housed within the footprints of the original towers. Bronze panels line the pools, listing the names of those who have passed. While my friend looked for a name of someone she knew, we noticed that the names weren’t in alphabetical order. I later learned that the names were placed using a complex algorithm based on where each person was located and who they were with at the time of their death. I found that to be a subtle, yet strikingly symbolic design element (not to mention, an amazing feat of mathematics and science – to learn more click here). Located between the pools is the memorial museum, which is slated to open in September, 2012. In the background stands the Freedom Tower, at 1776 feet, representing the year that the Declaration of Independence was signed. The overall design focuses on sustainability, with a green roof for the museum building, locally harvested trees, and additional features to conserve water and energy. Makes me want to see it all the more!